If enabled, you may have access to the Team Telephony feature that mimics the Busy Lamp Fields that you may have on your desk phone. If you do not have a desk phone, or you do not have any Busy Lamp Fields, then the Team Telephony window will not show. The Team Telephony window will appear automatically the first time you login if you have any Busy Lamps configured on your desk phone. By default, the window is set as Always On Top and it will appear over the top of any other window. The window has a number of options that let you control how you want it to appear. To change these options, click Preferences (the gear icon in the lower left corner), then choose Services from the drop-down menu. If you close the window, a warning box will appear to let you know you won’t receive Busy Lamp updates and a note on how to turn it back on. 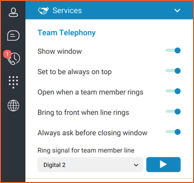 The Team Telephony configuration can also be accessed from the top-level menus by choosing Window->Team Telephony. If the option is grayed out, then you do not have any Busy Lamp Fields configured or do not have the service available to you.